This is the 4th & Final Quarter of the year, choi, this year has gone by so quickly. I remember writing my goals down at the beginning of the year. I remember doing the Quarter Year Audit too, the next audit will be done at the end of the year. Hope you have achieved some/most of the goals you set for yourself this year. If you haven't, you've got 3 months to go, Godspeed. So I'm excited to bring you this collaboration with Bukky of Pretty Faze. One of her friends, Tope, who is a Blog reader sent me an email saying she thinks I should collaborate with her friend as she's going to be in Nigeria over the Summer. So Bukky and I got talking over whatsapp but we couldn't meet up before she had to go back to Ukraine. She came up with many themes but we finally decided to do one to celebrate Nigeria's Independence day. It's amazing how there are Nigerians in literally every country around the world. These pictures were taken by the Amazingly talented Photographer & Graphic Designer, Niyi Okeowo. If you don't know him, check out his Website, Tumblr, Behance and get to know. Follow him on Instagram & Twitter too, you will definitely be inspired. I've had this skirt for 3 year, it was made by a Tailor from Ankara. I've had the shirt for 3 years too, I got it from Internacionale in the UK .I'm rocking my Trusty Zara Heels from Kampke.com, these shoes stay winning :) Don't forget to check out Bukky's Blog! Follow her on Twitter & Instagram too! This is Funfere Koroye, he is a cool creative guy and he rides a bike :) We had a shoot earlier in the day for a shoe brand, I like this picture!! 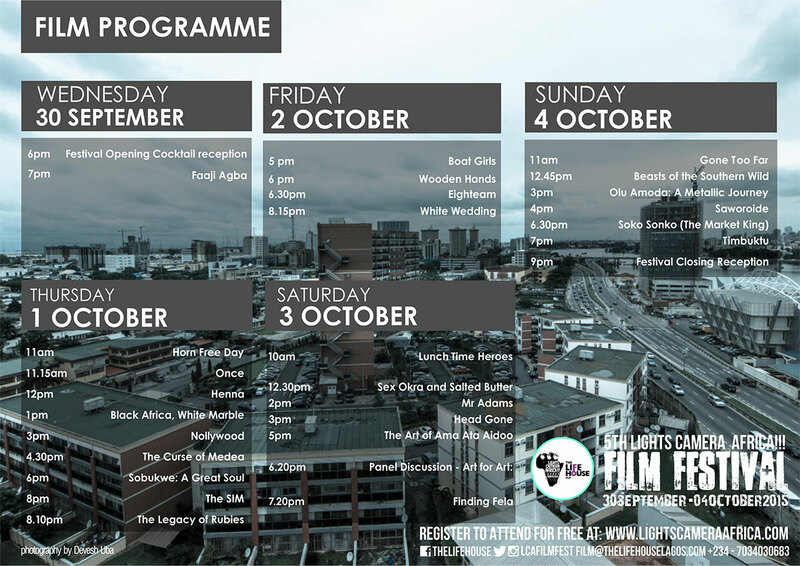 The LCA Film Fest starts today and it's free so check out the program below and stop by if you can. Your skirt is Ankara? It's beautiful. All Green Everything! Happy Independence Day! Nice pictures and your smile, infectious as always... Happy Independence day love. Beautiful smile you guys. You guys Rockest! Lovely pictures. You have such a beautiful smile. Happy Independence Day girl, yes those shoes stay winning. I love your hair and smile as well. Same to you Hunnie, Thank you!!! Ever green Tuke,you guys look fabulous and your hair.......I want. Lool, Thanks Tope :) Happy Belated Independence Day! I'm sure your hair can look this way too!! Thanks Hun, mine hasn't been working for a couple of weeks now. I'm going to get it fixed tomorrow, hoping it can be done shary! You look beautiful tuke!!! Your smile is infectious.